One of our Hope Farmer Trainees, Marine Veteran Christopher Katthage took a day off from tending crops to have a high-wattage turn in designer threads for a story about Hope Farms in the January Food Issue of Houston CityBook. Getting tapped for the cover came as a surprise for this first time model who obviously has talent in front of the camera! Check out the shoot. 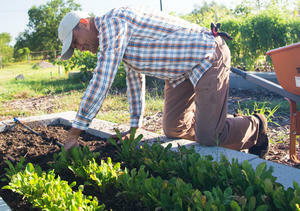 We recieved a Veterans Day gift from Forbes with this great feature article about Hope Farms. Read it Now. 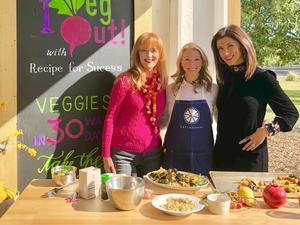 KHOU-Ch 11 Great Day Houston's Cristina Kooker feasted with Recipe for Success and Chef Erin Stewart from Define Foods on gorgeous dishes like Winter Kale Salad with Pear, Kumquat & Maple Vinaigrette... so delicious that you would never know it's healthy, too! Plus, how to stay healthy by taking the Veg Out Challenge. All the recipes can be found at vegoutwithrfs.org and you can watch the entire show here. It's not every day that one gets the chance to dine with 49 other interesting people at one long table. And it's even rarer to do so for a great cause. That's exactly what happened on June 24, and PaperCity's Catherine Anspon captured all the delicious fun, including the cocktails, the tomatoes, the short ribs, and the charred-tomato panna cotta. 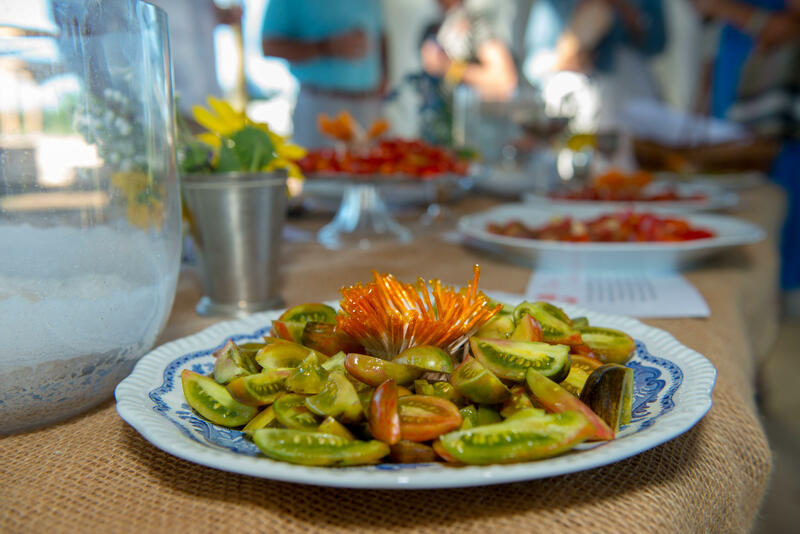 It was Chefs in the Field: A Tomato Tribute, and Alyssa Dole, Wayne Nguyen, and Martin Stayer wowed the crowd with their culinary creations. Monopole Wines provided the wonderful pairings, and Hal Brock's 22Fresh supplied the floral artistry and the bespoke cocktail. Read the complete PaperCity coverage here. The Houston Chronicle's Amber Elliott knows a thing or two about great social events, and she was positively glowing at Chef's in the Field: A Tomato Tribute, which took place on June 24 at Hope Farms. "I seriouly dreamt about that dinner all night," she gushed. From the heirloom tomatoes and bespoke cocktail, to the culinary creations of chefs Alyssa Dole, Wayne Nguyen and Martin Stayer -- including the Umami Bomb and charred-tomato panna cotta -- the evening was a giant success, and raised nearly $10,000 for the foundation's programs. Read Elliott's story here. Yes, it is going to be all about the tomato, so if you are a fan of the beloved fruit, you need to mark June 24 on your calendars. 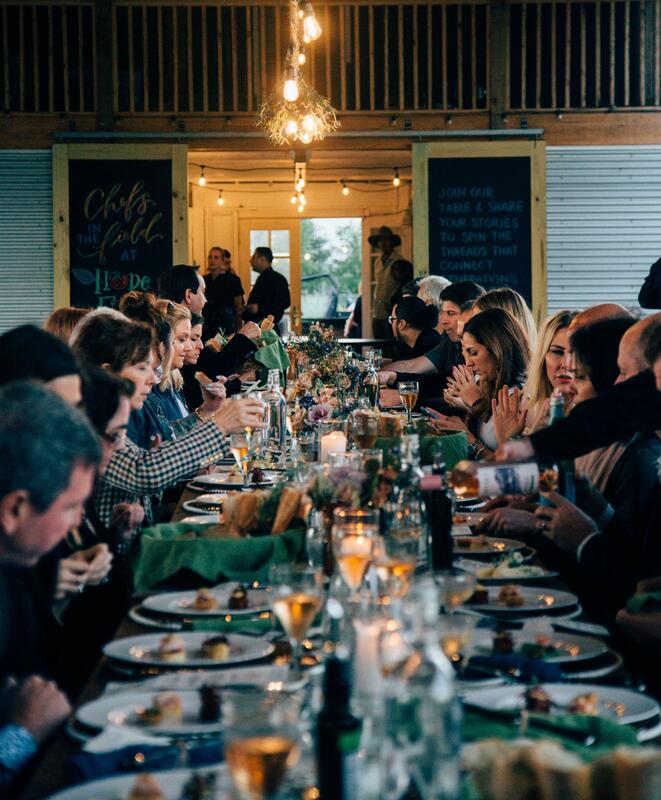 The Houston 100 has, and gave a shout-out to the Recipe for Success Foundation and Hope Farms this week, urging Houstonians to get tickets for the event without delay, because this fundraiser is going to sell out! 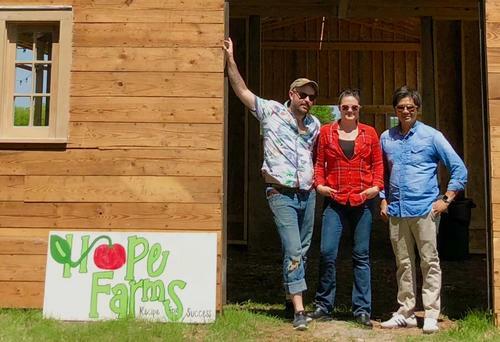 Chefs Alyssa Dole, Wayne Nguyen, and Martin Stayer willl be in charge of the food, and they will be using tomatoes from Hope Farms. Read The Houston 100's entry here, and get ready for some great eating! The media coverage of Delicious Alchemy: The Banquet continues with this piece from Culturemap Houston, which conveys all of the elegance, deliciousness, and fun that happened on May 7. The guests were treated to cocktails from Hal Brock (who also designed the floral arrangements for the evening), Rootstock Wines opened some exellent bottles, and the food. Well, the food was something special. The chefs and their teams created a 10-course tasting menu that exceeded expectations, a lineup that included ceviche, lobster bisque, duck leg, and more. The home of Lisa and Michael Holthouse was the perfect setting for the fundraiser, and we're already looking forward to 2019 and the first Monday in May, which is when Delicious Alchemy comes again. 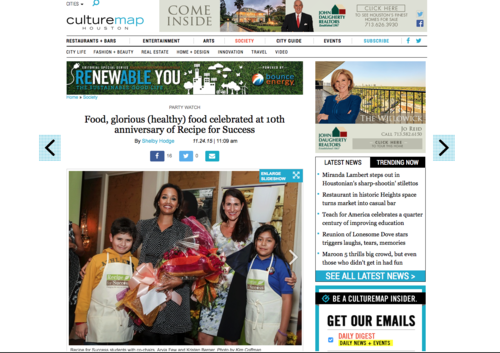 Read the Culturemap story here, and take a look at our stellar photos below. Ron captured a great interview with our veteran farming trainee Daniel Smith during his visit. Daniel was especially eloquent about the therapeutic impact of working on the farm for someone like him who has spend many years on the front lines for our country. KHOU anchor Ron Trevino recently brought his crew to RecipeHouse, where students from Post Oak High School were on a culinary adventure. According to Trevino, Recipe For Success Foundation is trying fight childhood obesity by making healthy food fun, tasty, affordable and easy. At the program's headquarters and kitchen in the Montrose area, students from Post Oak High School received a lesson in making healthy food choices. A chef taught them how to cook vegetable dumplings. "I think I'll be able to cook on my own instead of going to eat ramen for the four years I'll be in college," says Salvador Rivera, a senior at Post Oak High. 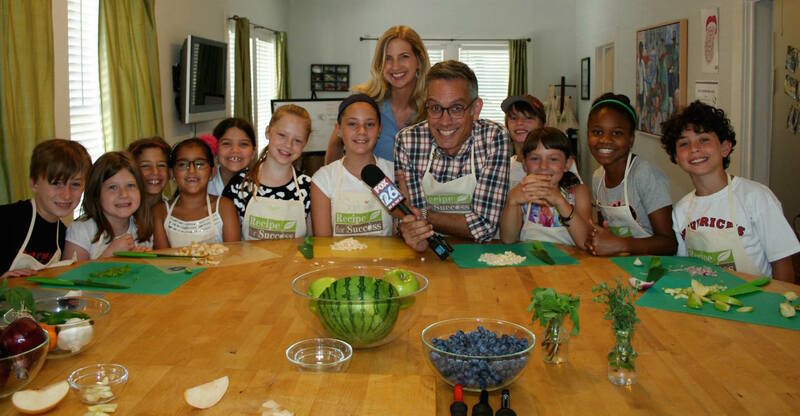 Recipe For Success tries to change the way kids look at food. "There are so many healthy foods that a lot of people don't know about and they taste really good," says student Emaya White. The founder of Recipe For Success is Gracie Cavnar. A former architect who, years ago, decided to do something to improve eating habits of children. "I got involved in getting vending machines out of elementary schools. In that process, I discovered this obesity epidemic," says Cavnar. The kids are learning from chefs, teachers and even gardeners, as they're actually growing food as well. A number of area school districts are using the curriculum. The program that started in Houston has expanded to other cities across the country. "It makes me feel really good to see the extraordinary impact we have had on so many people, changing lives for the better," says Cavnar. The goal is to inspire a whole culture of healthy eating. Watch the entire clip HERE. 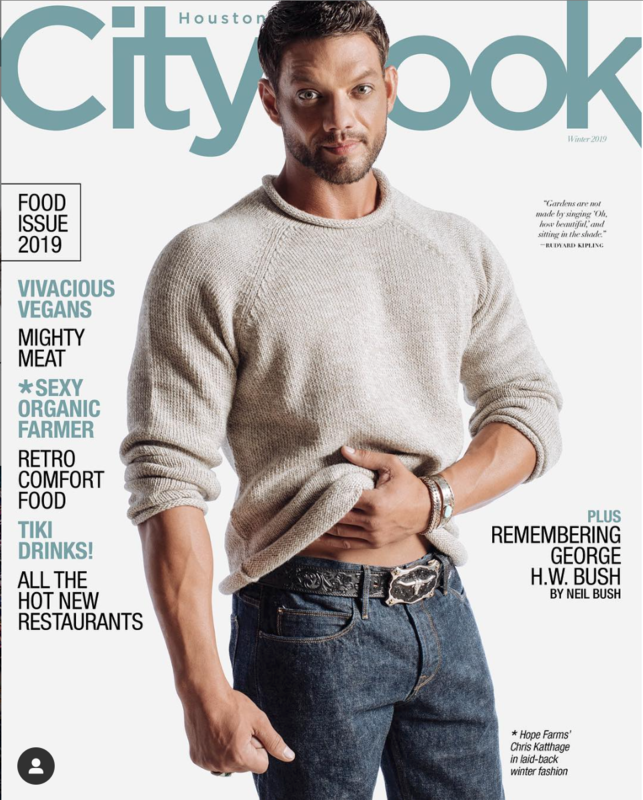 By mid-morning, Justin Myers' hands were covered with dirt, his stubble dripped with sweat and his clothes smelled like the dark soil he was using to plant the upcoming season's crops. Continue reading Chronicle Reports on Hope. 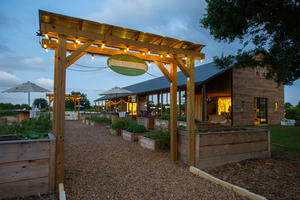 Houston CityBook features Hope Farms in August 2017. 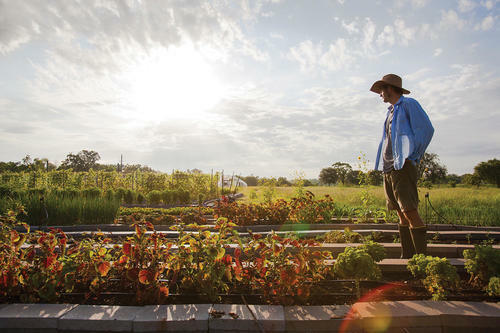 On the corner of Scott Street and Airport Boulevard in the historic Sunnyside neighborhood in southern Houston, a garden blooms. Behind a chain-link fence, in a field formerly occupied by the now-torn-down Carnegie Vanguard School, lie row after cheery row of cherry tomatoes, eggplant, bell pepper and okra. 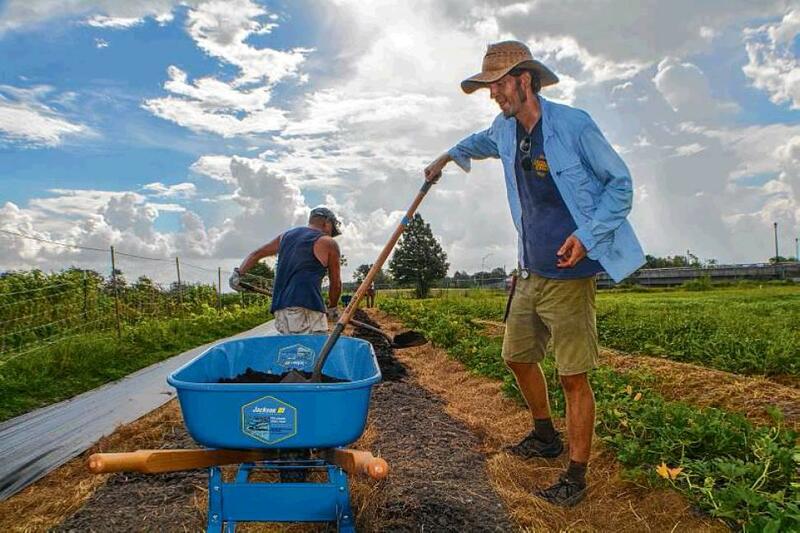 On a bright day in July, the two currently cultivated acres of the seven-acre plot are being carefully tended to by a handful of workers -- all U.S. veterans -- who are just as eager to see the fruits of their labor at Hope Farms as Gracie Cavnar, of the nationally lauded and Michelle Obama-endorsed Recipe for Success. Cavnar is the founder of and visionary behind the urban vegetable oasis, which is bringing fresh and healthy produce to one of the city's largest food deserts. Read more. 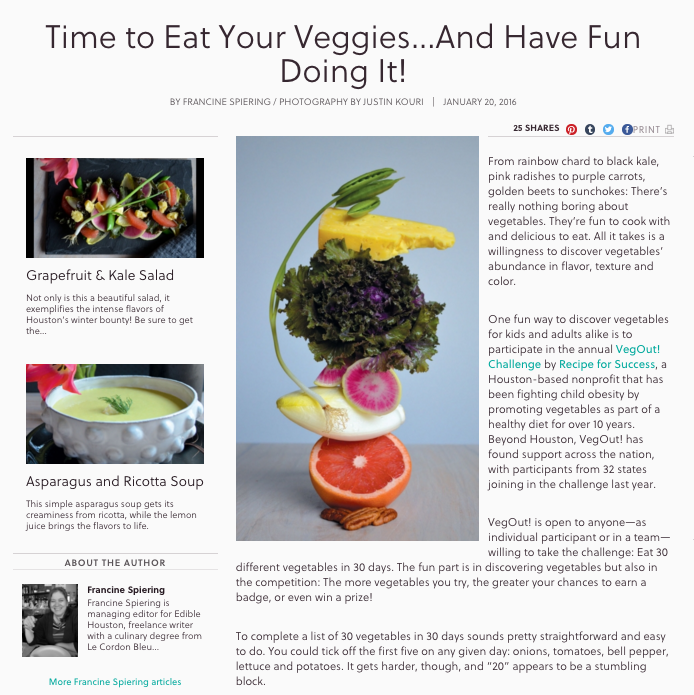 The editorial team at Eating Well are ramping up their veggie intake and challenging each other in VegOut! this month. 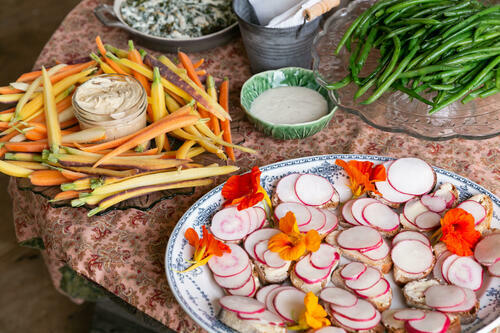 They praise the work of Recipe for Success in their most recent publication and feature Chef Justin Kouri, along with his recipe that gives a spin to the "humble" radish. 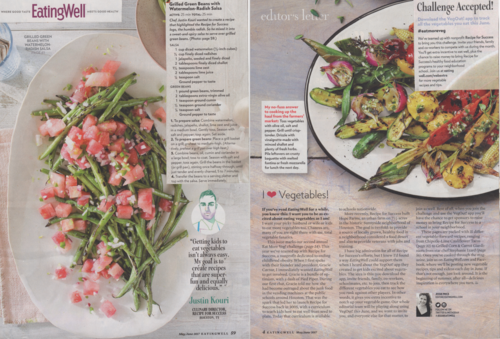 Get out your mixing bowl and give Chef Justin's Grilled Green Beans with Watermelon-Radish Salsa a try! The May issue of Family Circle Magazine featured Recipe for Success Founder, Gracie Cavnar as one of the country's 20 Most Influential Moms in recognition for her work. 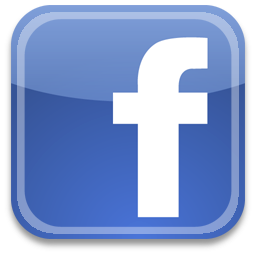 Follow this link for the online version. 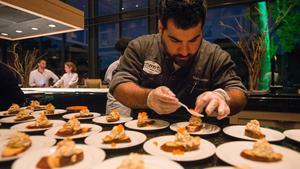 Recipe for Success' second annual "Delicious Alchemy" dinner party was a trip. And not just because two members of the waitstaff had fallen into the pool in Becca and John Thrash's solarium by the time the cocktail hour ended. Read whole story. "When I heard about Recipe for Success, it really touched my heart," [chair Tammie] Johnson said in between courses. "Young children need to understand that their brain, heart, and body all function best with good food." The whole story from Amber: "Recipe for Success founder Gracie Cavnar is usually all about the food. 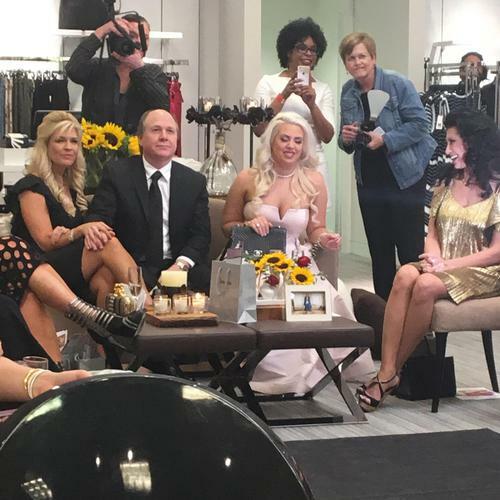 On Thursday evening, however, she invited mother/daughter duo Tammie Johnson and Brittany Randolph to chair an evening in celebration of another popular f-word: fashion. Neiman Marcus hosted the party-in-two parts located on the Galleria department store's third floor. There, a stylish crowd gathered for Haute Hippie's bohemian-chic runway show; Neal Hamil models sashayed down the catwalk in gunmetal-accented, vintage-inspired pieces - a timely presentation for last minute Houston Livestock and Rodeo-wardrobe shopping. Afterward, select VIPs slinked away for an intimate dinner at in-house eatery, Mariposa. Most got the "intimate" memo, anyway. One particularly raucous table brought Steak48-level energy to the private soiree, though Cavnar handled their revelry in stride. "We manage to teach kids that healthy foods can be delicious, easy, and fun," she said above the noise, concisely explaining her organization's MO. "Now I invite you all to pull out your phones and search for an app called 'VegOut.' 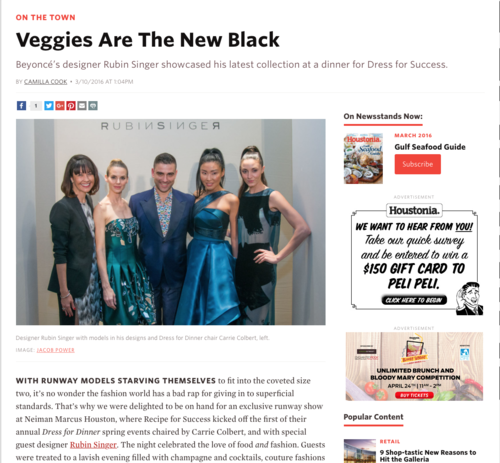 Vegetables are the new black." The digital tracker helps "VegOut! 30 Ways in 30 Day Challenge" participants try 30 different vegetables in 30 days during the month of March. In keeping with the theme, Union Kitchen's chef Henry Hopkes served minestrone soup, zucchini and mushroom stuffed lasagna, and a berry tart to dinner-goers. "When I heard about Recipe for Success, it really touched my heart," Johnson said in between courses. "Young children need to understand that their brain, heart, and body all function best with good food." 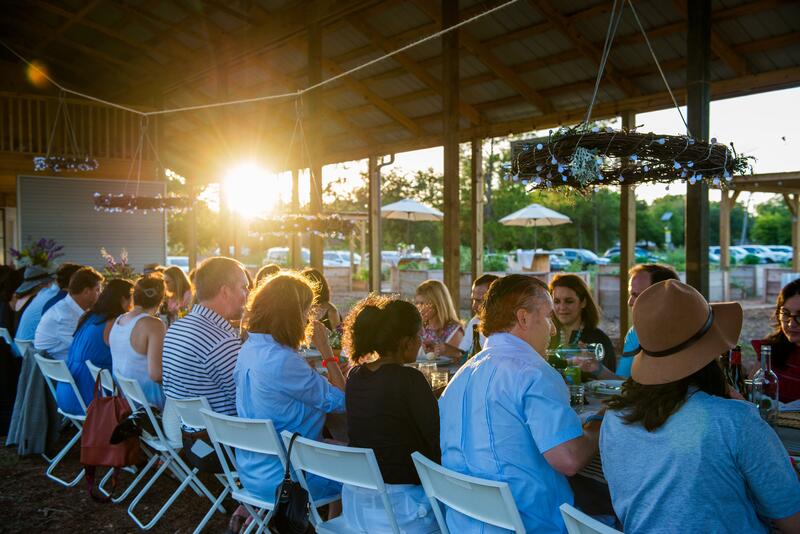 Good food will be the focal point of the organization's signature spring fundraiser, Delicious Alchemy, a 10-plate dinner event held at Becca Cason Thrash's legendary party pad next month. Only 10 seats (out of 100) remain. 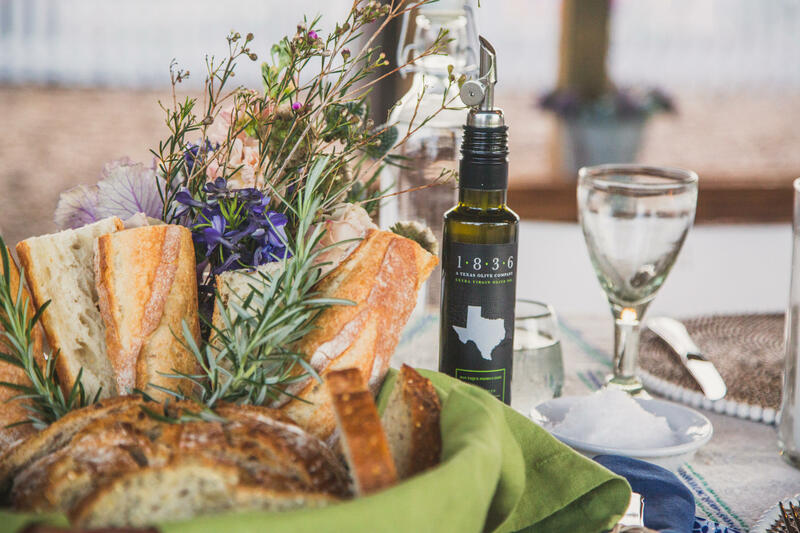 Haute Hippie's newly appointed creative director, Cady Vaccaro, won't be at the April bash, though she made sure to get her fill of local flavor during this - her first - trip to the Bayou City. A knowledgeable server at Pax Americana gamely wrote recommendations on a napkin the night prior. His top suggestions? The Pastry War, Bad News Bar, and Anvil all came highly endorsed. Thursday's attendees walked away with buzz-worthy swag. In addition to Aerin rose oil and body cream, guest Theresa Roemer placed copies of her new book, "Naked in 30 Days: A One-Month Guide to Getting Your Body, Mind, and Spirit in Shape," inside each bag. After a month of healthy eating, one would hope to be in peak physical shape, right?" Our Eat This! Summer Camp sparked the interest of several media outlets in August. Dozens of enthusiastic 8-to-11 years olds learned about the food business with us, especially how food is marketed to them, so that they will always be able to discern the difference between promotional language on the front of the box and the facts on the side. The kids spent their camp week at RecipeHouse developing a great-tasting healthy food product to sell at Revival Market. Ryan Pera and his team at Revival selected a winning product to produce and feature on their retail shelves throughout August and September with all proceeds donated to Recipe for Success. 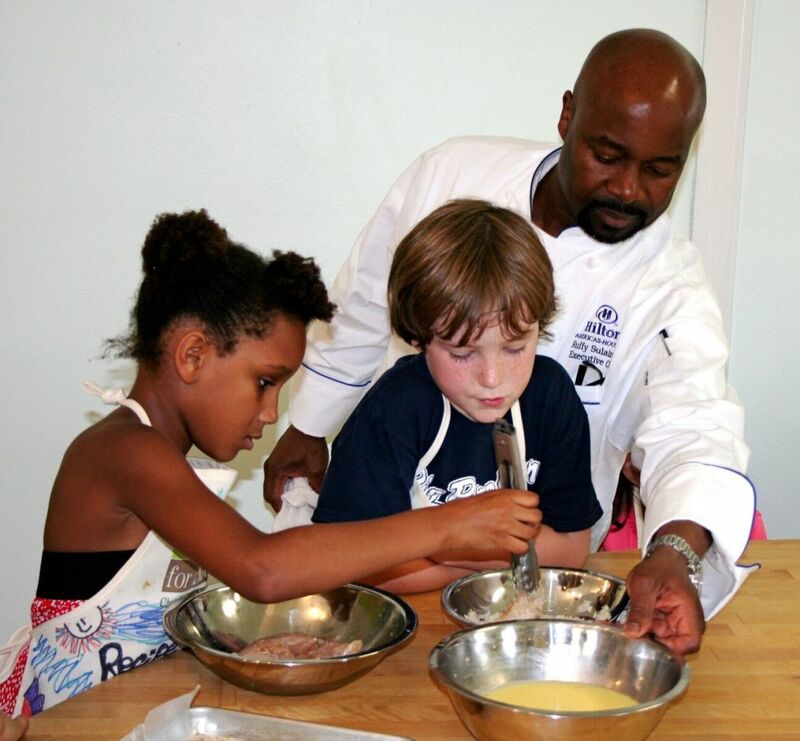 A BIG thank you to Chef Pera for supporting our campers and the Foundations efforts to change the way kids eat! 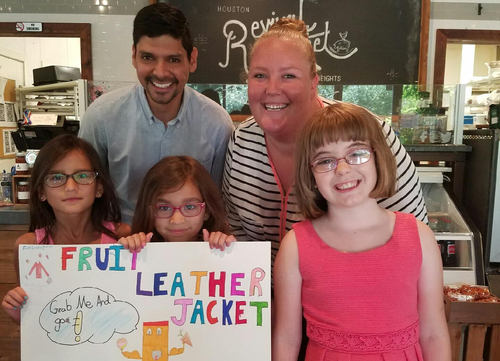 The "Fruit Leather Jacket" (roll-ups made of peaches, honey, carrot and lemon juice), won out over "Melony Mist" (a sparkling watermelon aqua fresca). Stop by Revival Market to pick yours up and read some of the great coverage in Culture Map and The Houston Chronicle. 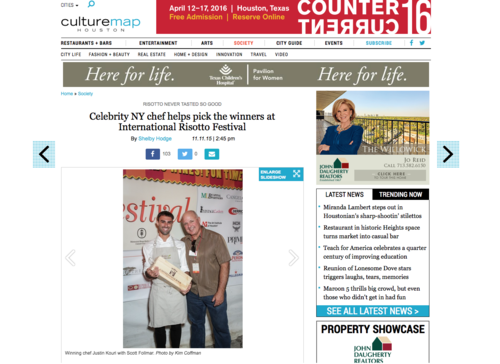 Dateline May 6, 2016 Houstonia Magazine: Locavore chefs share their skills with kids--and foodie adults. Once a month, chef Ruffy Sulaiman goes to MacGregor Elementary School. He got his own elementary education long ago in Lagos, Nigeria, but he says that doesn't keep him from learning on his regular visits with students. 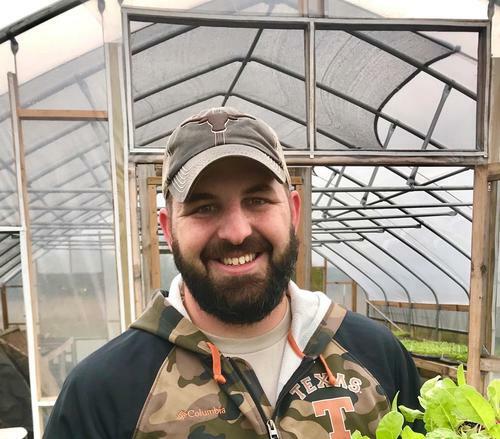 "Because of what the kids are doing at the school, growing their own things, I've started looking into growing some plants in-house," he says. In his role as executive chef at the Hilton Americas, Sulaiman is currently working to start a rooftop garden that will supply the kitchen at 1600 Bar + Grill. 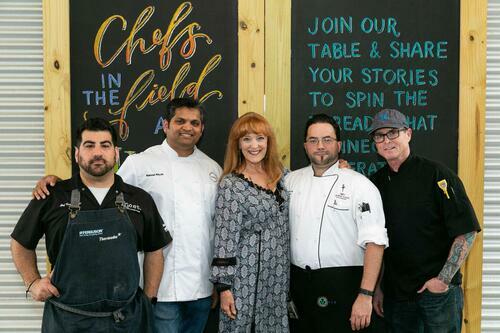 It's all in a day's work as part of Recipe for Success' Chef Advisory Board. Read more. Seed-to-Plate Kids Go Iron Chef! 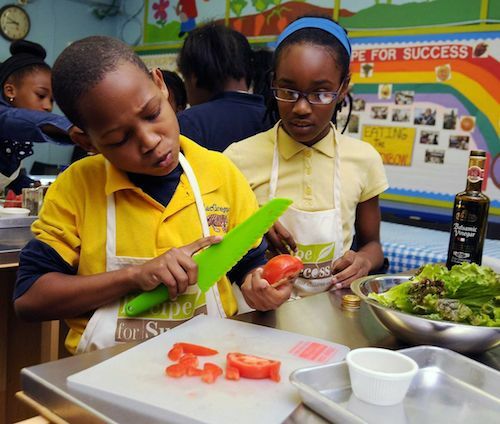 As the school year comes to a close, Seed-to-Plate kids have the opportunity to show off all the healthy cooking skills they've learned throughout the year. 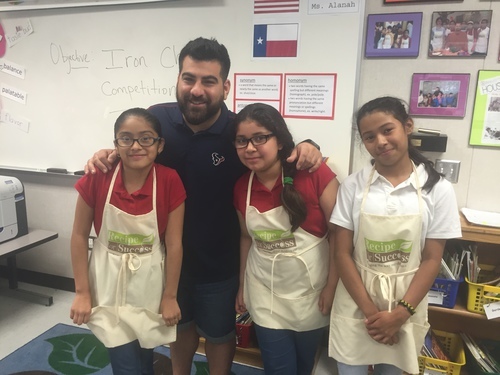 The culmination of the Super Foods semester at Recipe for Success Foundation Showcase School, Sylvan Rodriguez Elementary, added some healthy cooking competition and mystery ingredient fun to the mix! Students started their class with a quick lesson on a creating the perfect Super Salad using a combination of flavors and textures from Houston Chef and owner of Roost, Chef Kevin Naderi. They then selected a bowl full of mystery ingredinetns and had 20 minutes to complete their salad before judging. Judges enjoyed sampling the 4th graders creations and seeing their enthusiasm in creating new flavor profiles! You can see all the action here from Houston's FOX affiliate! KHOU employees Make A Difference! 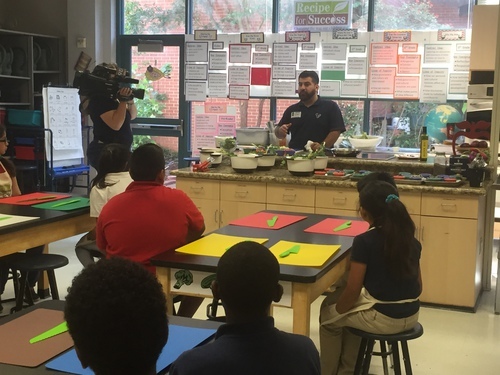 On Saturday, April 9th, staff from Houston's KHOU-Channel 11 selected Recipe for Success for their annual Make A Difference Day! 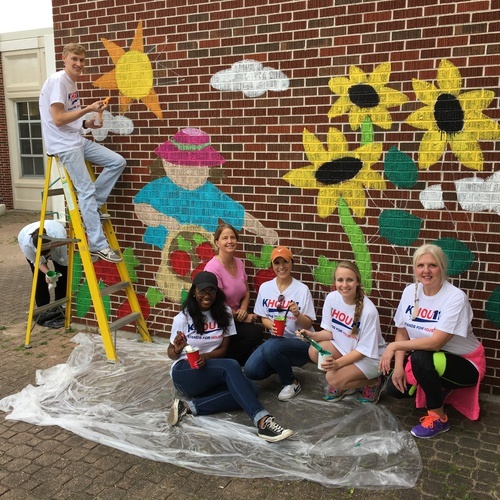 See how generous KHOU staffers and their families helped our Showcase School Briscoe Elementary build more gardens and paint murals and learn more here. If you're a parent, you know how hard it is to get some kids to eat vegetables. Recipe for success has came up with a way to make healthy eating fun for some kindergarten and first grade students at the Grace School . Watch the adorable video here. 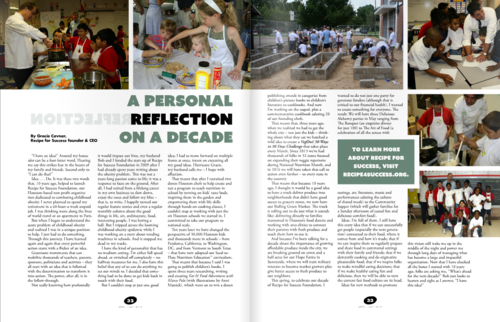 Pick up the April/May issue of My Table magazine for a reflective look at the last ten years from our Founder and CEO, Grace Cavnar. You can also read the issue digitally here. If all goes according to Gracie Cavnar's plans, her groundbreaking Recipe for Success actually will be breaking new ground in April - on a real working farm in Houston's Sunnyside neighborhood that will provide fresh, affordable produce to people who need it most. Read the full article in the March 2016 Houston Gives section of the Houston Chronicle or click HERE if you are a digital subscriber. 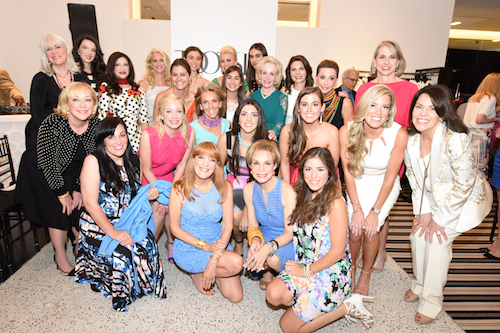 Last week I attended the Recipe for Success Foundation's Dress for Dinner event at Neiman Marcus. This was the 5th event organized by Season 7 Chair, Carrie Colbert. 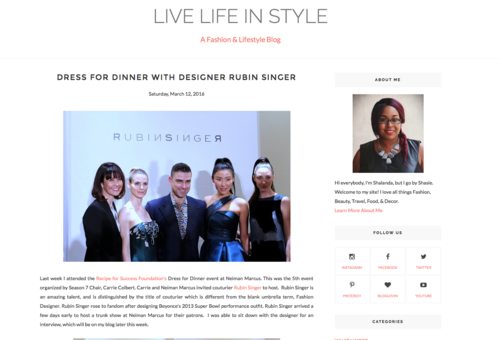 Carrie and Neiman Marcus invited couturier Rubin Singer to host. Rubin Singer is an amazing talent, and is distinguished by the title of couturier which is different from the blank umbrella term, Fashion Designer. Rubin Singer rose to fandom after designing Beyonce's 2013 Super Bowl performance outfit. 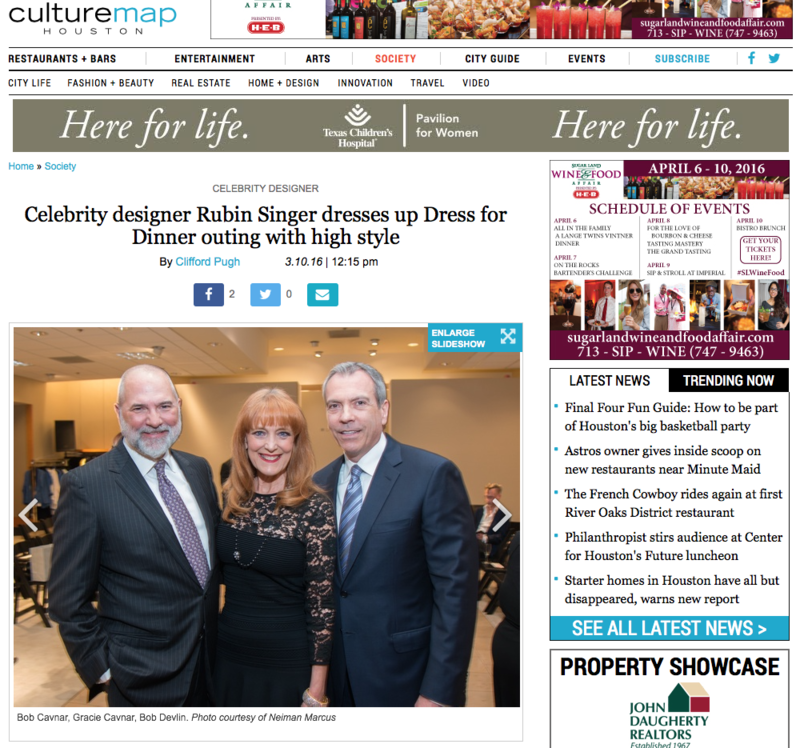 Rubin Singer arrived a few days early to host a trunk show at Neiman Marcus for their patrons. I was able to sit down with the designer for an interview, which will be on my blog later this week. The scoop: Dress for Dinner, the Recipe for Success Foundation's fundraising series that combines stellar fashion with great food, teamed with Neiman Marcus to feature the designs of Rubin Singer, whose creations are favorites of celebrities, including Tracee Ellis Ross,who recently wore one of his slinky black gowns to the NAACP Image Awards, and Beyoncé, who thrust Singer into the spotlight when he created her costumes for her halftime appearance at the 2013 Super Bowl. Singer was in the front row as his fall collection featuring bold geometrical shapes and colors was unveiled on the runway created for the occasion on the department store's third floor. Afterwards VIPS feasted on a dinner prepared by Roost chef Kevin Naderi that included smoked beet salad with whipped feta mousse, grilled ahi tuna with carrot puree and almond cake. Naderi planned the dinner based on the organization's VegOut! 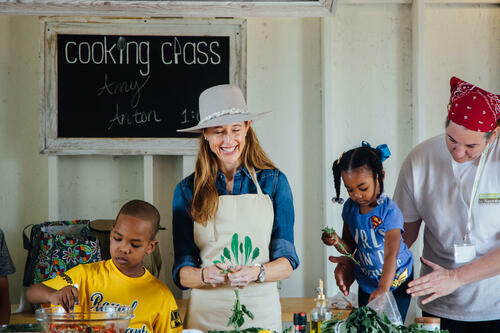 program, which encourages Houstonians to eat 30 different vegetables in 30 days this month. Read the full article and see the accompanying slideshow HERE. WITH RUNWAY MODELS STARVING THEMSELVES to fit into the coveted size two, it's no wonder the fashion world has a bad rap for giving in to superficial standards. That's why we were delighted to be on hand for an exclusive runway show at Neiman Marcus Houston, where Recipe for Success kicked off the first of their annual Dress for Dinner spring events chaired by Carrie Colbert, and with special guest designer Rubin Singer. The night celebrated the love of food and fashion. 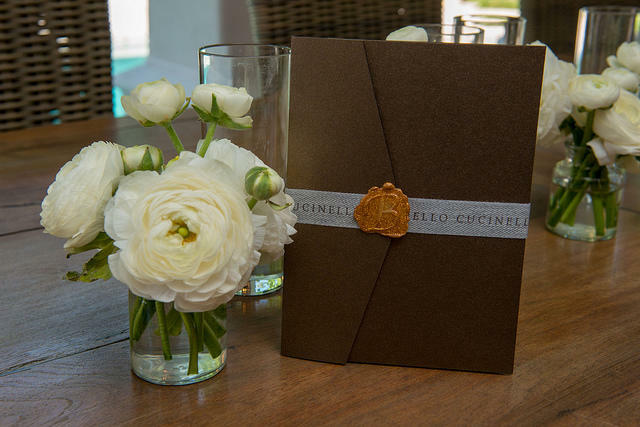 Guests were treated to a lavish evening filled with champagne and cocktails, couture fashions and tasty vegetable munchies by chef Kevin Naderi from Roost. 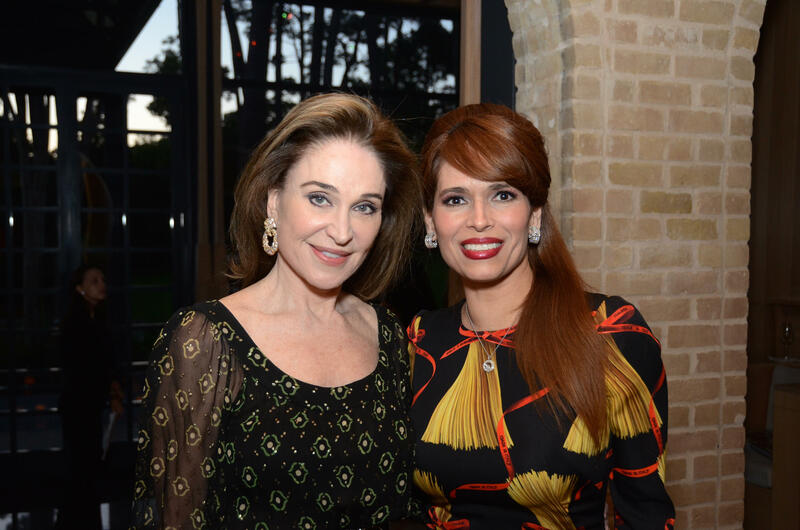 The Recipe for Success foundation is the brainchild of Houston author and fashionista Gracie Cavnar. What began as a grassroots effort to get vending machines out of elementary schools has turned into the largest nutrition education program in the country, started right here in Houston. The foundation's programs connect children to their food via the trademarked Seed-To-Plate nutrition education, not only in Houston schools, but coast to coast with affiliate partners from California to Washington, D.C.
Read the whole artilce HERE. Fashion designer Rubin Singer sat cozily with his arms folded as Neal Hamil Agency models sauntered out wearing pieces from his collection. It's a rare moment for any designer to have a front-row seat to their runway show. Most are backstage. 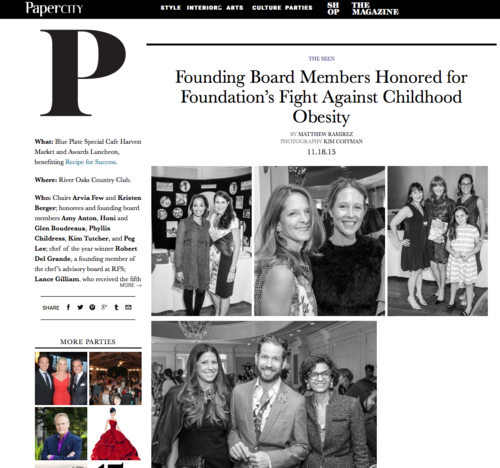 At Neiman Marcus Thursday night, Singer was beaming at the Recipe for Success Foundation's Dress for Dinner event, chaired by Carrie Colbert. His collection of sophisticated, sculptural gowns and dresses drew applause and "ahs" from the stylish audience. Read the rest of the article and see the photos HERE. KHOU's Courtney Perna stopped by Recipe for Success showcase school MacGregor Elementary to kick-off the VegOut! Challenge. Our Seed-2-Plate students showed off their chopping skills while talking about their favorite veggies! Watch the full segment HERE! What happens when you put fourth graders and parsnips together in a kitchen? At Sylvan Rodriguez Elementary in Houston, first- through fifth-graders attend gardening on Mondays, nutrition on Tuesdays and cooking on Thursdays, each a 55-minute class that's part of their core curriculum. Thursdays in particular are "always exciting," said Paola Tello, an instructor for Recipe for Success, which administers the program. "Even in nutrition class, I'm cutting citrus open, letting them touch and smell." And when it comes to kids, familiarity is the first step towards appetite. Time to Eat Your Veggies...And Have Fun Doing It! From rainbow chard to black kale, pink radishes to purple carrots, golden beets to sunchokes: There's really nothing boring about vegetables. They're fun to cook with and delicious to eat. All it takes is a willingness to discover vegetables' abundance in flavor, texture and color. One fun way to discover vegetables for kids and adults alike is to participate in the annual VegOut! 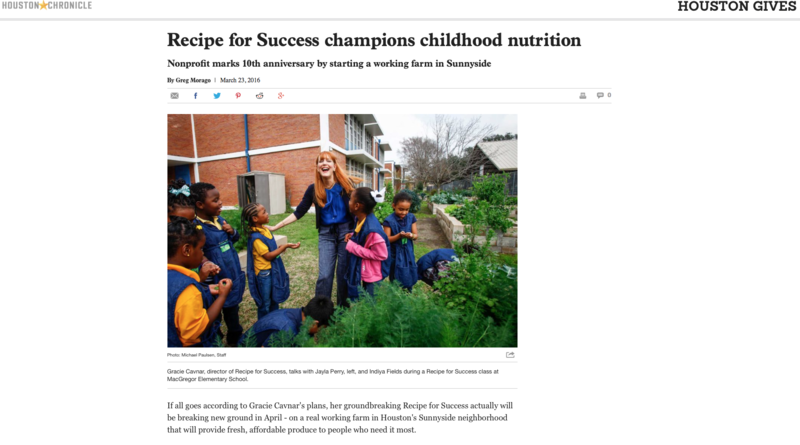 Challenge by Recipe for Success, a Houston-based nonprofit that has been fighting child obesity by promoting vegetables as part of a healthy diet for over 10 years. 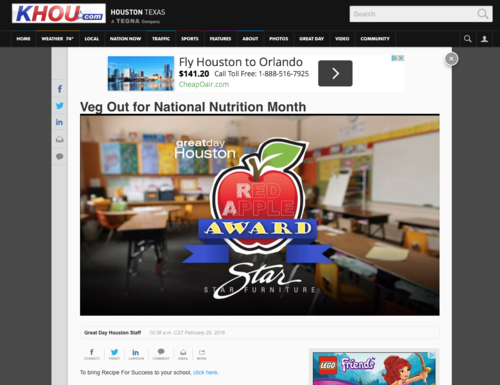 Beyond Houston, VegOut! has found support across the nation, with participants from 32 states joining in the challenge last year. VegOut! is open to anyone--as individual participant or in a team--willing to take the challenge: Eat 30 different vegetables in 30 days. The fun part is in discovering vegetables but also in the competition: The more vegetables you try, the greater your chances to earn a badge, or even win a prize! To complete a list of 30 vegetables in 30 days sounds pretty straightforward and easy to do. You could tick off the first five on any given day: onions, tomatoes, bell pepper, lettuce and potatoes. It gets harder, though, and "20" appears to be a stumbling block. "The biggest feedback we got from folks who registered last year and did not finish--even ones who considered themselves super healthy eaters--was that they hit the wall at 20 and it was really tough for them to track veggies when they were traveling for business or on spring break or eating out," says Gracie Canvar, founder of Recipe for Success. It's one of the reasons why Recipe for Success developed a new app designed to help you keep track of vegetables wherever you are, look them up, or find suggestions for recipes and ways to prepare. With this app and web resources like Recipes A-Z, the 1-click Tracker and an interactive Find Your Veg map, the 2016 VegOut! Challenge is set up to be accessible to anyone trying to eat healthier, for the workplace to use it as a wellness tool and for (grand) parents to challenge kids to enjoy vegetables. There is really no excuse not to veg out every day--so bring home those veggies and eat them braised or grilled, roasted or raw, in a soup, salad or stew, not just for 30 days but year-round. Download the FREE mobile app from your app store and register. You can also visitVegOutWithRFS.org to register and explore our endless resources. The app and website integrate seamlessly. The new app makes it easy to find fresh vegetables on the go with a find-your-veggie map. Don't forget: You can sign up as individual or as a team. Earn badges and make sure you're in the running for a prize! 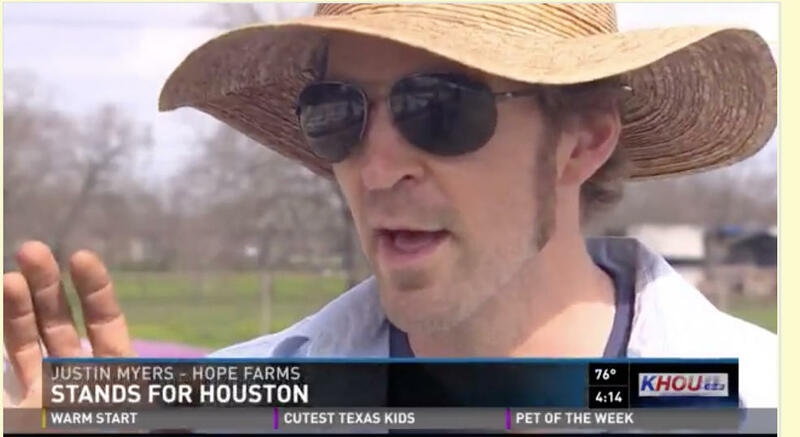 Recipe for Success Foundation has teamed up with the University of Houston to address the troubling issue of food deserts in Houston with Recipe for Success Foundation's new Hope Farms initative. The UH School of Architecture has designed urban farm models for Recipe for Success Foundaiton's Hope Farms to prove residents with their own fresh produce and train them as urban farmers. 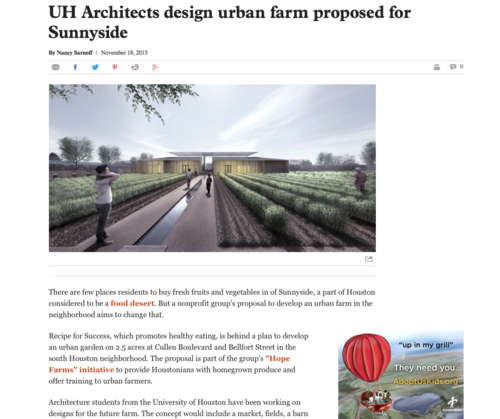 Gracie Cavnar, founder of Recipe For Success and UH Architecture student, Alejandra Cervantes talk about Hope Farms and the UH School of Architecture plans. Hello and Happy Holidays! 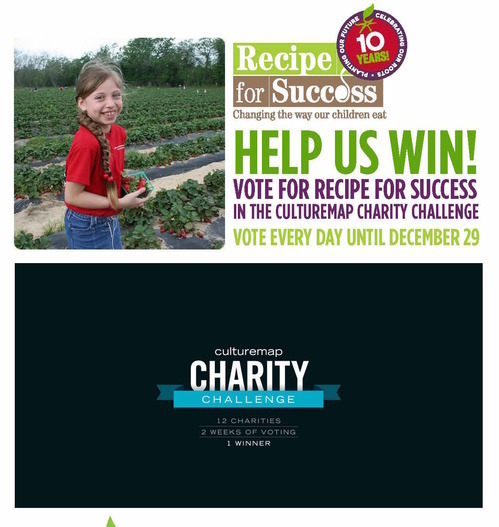 Recipe for Success Foundation is excited to announce we have been selected as one of the 12 charities to participate in CultureMap's 2016 Charity Challenge. Please join us in voting everyday between December 15th to December 29th. The charity with the most votes will be chosen as CultureMap's Charity Partner. This partnership will allow us to continue to impact young lives as we combat childhood obesity by changing the way children understand, appreciate and eat their food. Thank you in advance for your support and sharing with your family and friends! Vote here! Authors of How to Feed a Family: The Sweet Potato Chronicles, Laura Keogh and Ceri Marsh shared their golden rules of cooking with the gathering of 400 guests dedicated to helping Recipe for Success in its mission to combat childhood obesity. Leading the charge that raised $200,000 for the non-profit were chairs Arvia and Jason Few and Kristen and John Berger. Read the article here and see some of the fun highlights from the luncheon! Recipe for Success drew 400 warriors who raised more than $200,000 for the foundation on its tenth birthday, celebrating a decade of award winning programs and efforts in a continued fight against childhood obesity. See all the fun pictures and read the full article HERE. There are few places residents to buy fresh fruits and vegetables in of Sunnyside, a part of Houston considered to be a food desert. But a nonprofit group's proposal to develop an urban farm in the neighborhood aims to change that. 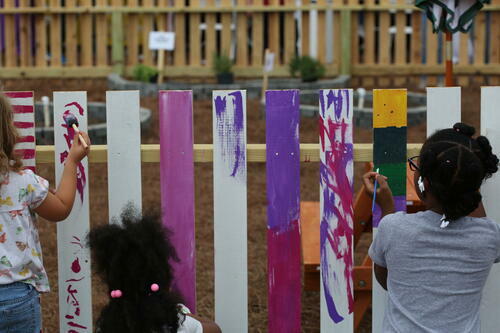 Recipe for Success, which promotes healthy eating, is behind a plan to develop an urban garden in the south Houston neighborhood. The proposal is part of the group's "Hope Farms" initiative to provide Houstonians with homegrown produce and offer training to urban farmers. Read the rest of the article and see pictures from the presentations HERE. 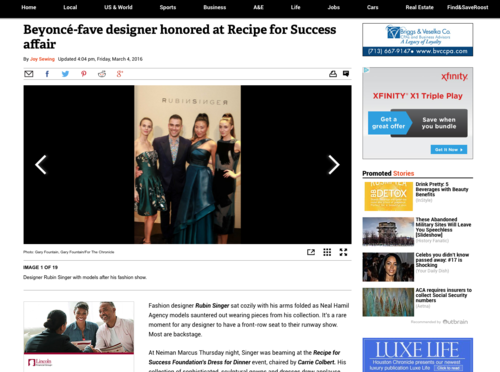 Last month, Recipe For Success Foundation, hosted their 2nd Dress for Dinner Season VII fundraising event, hosted by designer Edgardo Osorio. Edgardo is the Founder and Creative Director of Aquazzura Firenze, a relatively new shoe company (Founded in 2011) that has become a staple on the feet of fashionistas and celebrities around the globe. This was Edgardo's first time in Houston, but not his first visit to Texas. Edgardo had previously visited Dallas, TX. The event was hosted at Saks 5th Avenue, and kicked off with networking and shopping with the shoe designer. 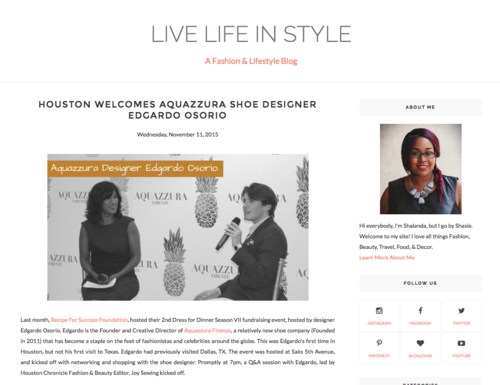 Promptly at 7pm, a Q&A session with Edgardo, led by Houston Chronicle Fashion & Beauty Editor, Joy Sewing kicked off. Read the rest of the write-up and see pictures HERE. 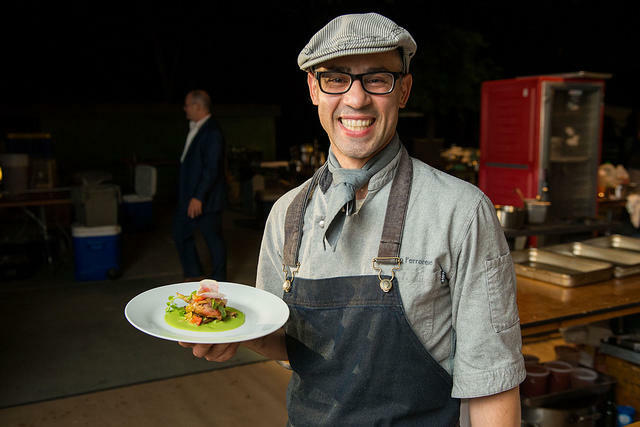 Proving that healthy food can be super delicious, our own Chef Justin Kouri won the competition for taste buds at the recent showdown among Houston's culinary ruling class. 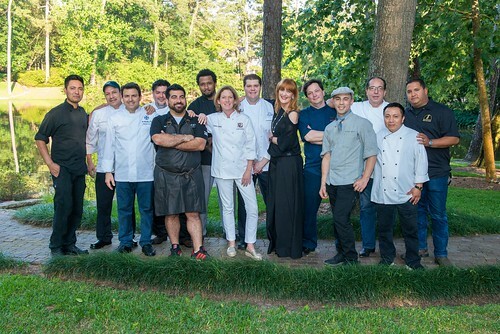 New York-based celebrity chef Rocco Dispirito was just one element that wowed the throng of 800 who turned out at Houston Design Center for the 11th International Risotto Festival. Italian music and wines played backdrop to the coterie of chefs who whipped up tantalizing versions of the Italian specialty. 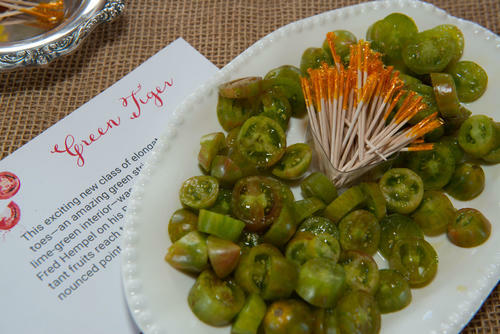 While guests grazed through the offerings, more than a dozen waited for the judges' decision on top honors. Dispirito led the team in the blind tasting. 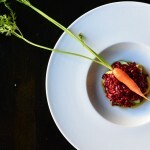 In the end, it was Justin Kouri, representing Recipe for Success, who took top prize for his HeartBeet Risotto. 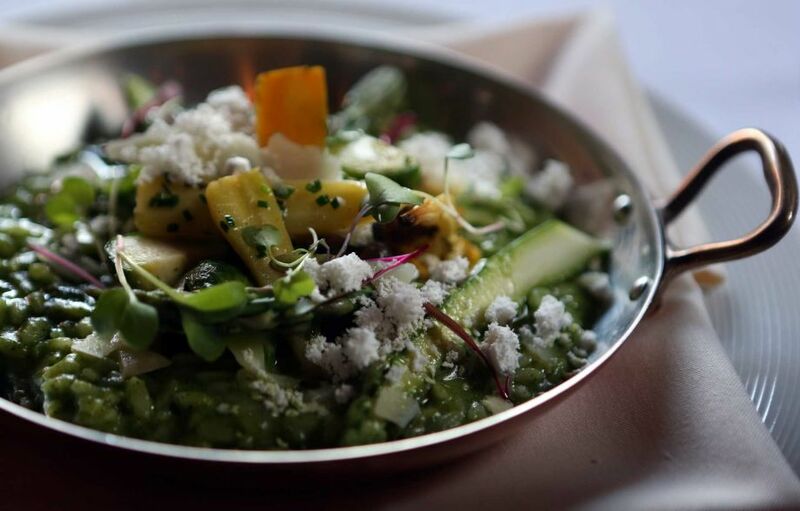 Read more here and create your own award-winning risotto dish with the all-veg recipe here. With the fall garden season is upon us, be sure to pick up the September/October 2015 issue of Edible Houston magazine to read the great article by Jenna White on farmers marKIDS! The article showcases our free farmers marKIDS program and features quotes from Recipe for Success Agriculture & Garden Director Justin Myers, as well as multiple garden instructors. 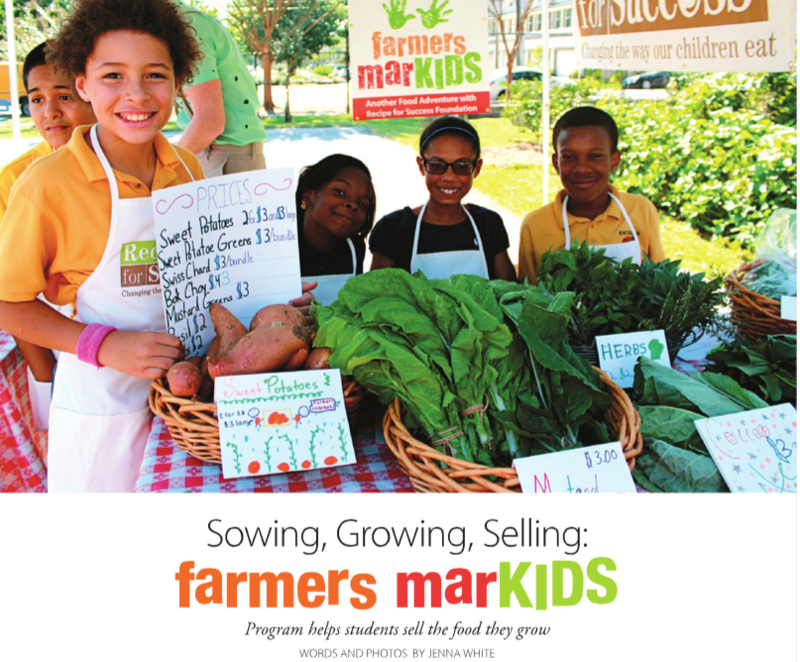 If you haven't already, download the farmers marKIDS toolkit and make plans to host a farmstand during farmers marKIDs DAYs, Oct. 20-26 each year. You can also come support local school kids and celebrate Food Day 2015 at our farmers marKIDs stand at Discovery Green on Satuarday, October 24! Savor the fall harvest! Eat This! 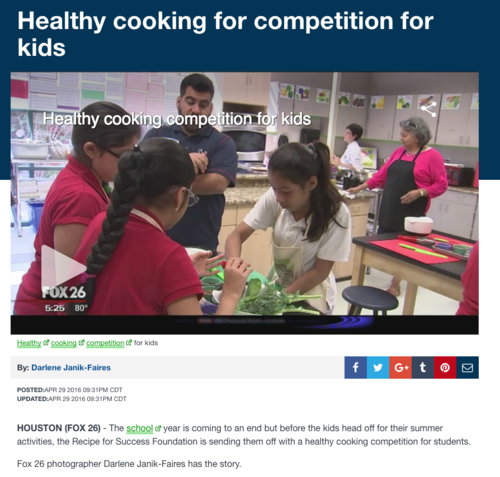 Summer Camp on FOX 26 news! We were delighted when Ruben Dominguez of FOX 26 showed up to feature our Eat This! Summer camp on their morning news program! Ruben reported on our final camp session for the season anda gave us the opportunity to tell viewers about our mission and other programs. Check out the video featuring Chef Paola and some talented Summer Camp chefs! Thanks again to Ruben and FOX 26! Some women are born with a fashion gene. Houston mothers and daughters with innate style walked down the runway Wednesday as Tootsies hosted Recipe for Success' fourth annual Dress for Dinner - The Fashion Gene Awards Show. Nanette Lepore was the featured designer and dinner guest for the post-party feast prepared by chef Barbara McKnight of Culinaire. Mother-daughter team Leisa Holland-Nelson and Laura Nelson Rose chaired the event. CultureMap's Clifford Pugh served as master of ceremonies. As the duos took their turns on the catwalk, he revealed what each thought about the other's sense of style -- and past fashion faux pas. "Shoulder pads," was the common criticism the daughters had for those moms who lived through the '80s. The publication highlighted our entreprenurial kids in their #3 issue in May 2015 with this story by Jenna White. 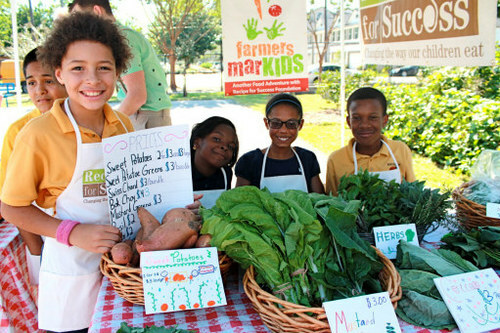 Last year, after nearly a decade of connecting children with their food through hands-on culinary and garden lessons, Recipe for Success Foundation sprouted a sweet idea: Use the garden to teach financial literacy. They named the resulting program Farmers MarKIDS. Read more. Caloric indulgences are always aplenty in Houston. But when the rodeo pulls into town, temptations can overwhelm even the most sensible of diets. Houston has nearly a month-long love affair with chocolate-dipped cheesecake, foot-long sausages on a stick, funnel cakes with a flurry of powdered sugar, heaping portions of barbecue, jaw-busting burgers and deep-fried bacon during the run of the Houston Livestock Show and Rodeo. 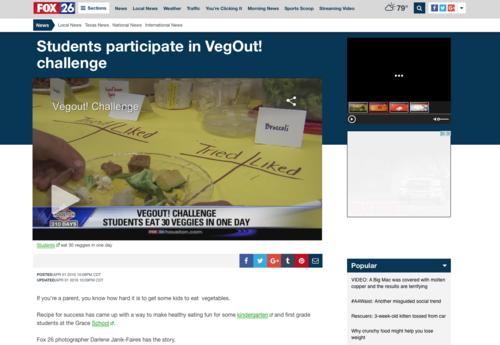 Which makes VegOut!, a campaign sponsored by Recipe for Success, so perfectly timed. Read the whole story. Houston Chronicle reporter, Rebecca Hennes wrote about our work in the HealthZone section on Sunday, Feb 22, 2015. "For decades, kids have tried every trick in the book to avoid eating vegetables. 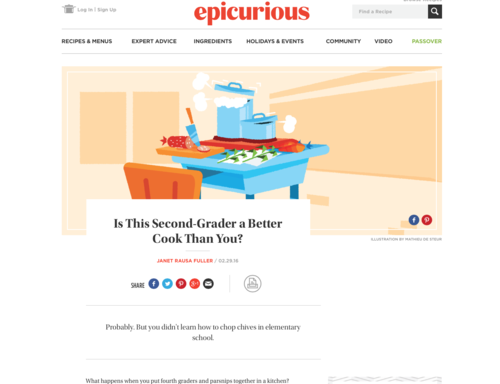 Recipe Is In the News! This page is an archive of recent entries in the Recipe Is In The News! category. Dinner Conversations is the previous category. Dish with Gracie is the next category. Look in the archives to find all content.